Donald Trump campaigned as a successful business mogul whose negotiating skills made him uniquely qualified to be a president capable of ending Washington’s decades of bitter partisanship to get things done. There’s a back story to all that winning, of course. Because Trump’s party controls the floor in both chambers and is loath to hold votes when facing the prospect of defeat, Republicans were primed somewhat for success. In addition, rules changes for judicial and executive nominees (all of which carry stated presidential positions) removed the threat of a 60-vote threshold for nominations, meaning Republicans could prevail on such votes with only members of their caucus. Yet even with many advantages, in his first year Trump struggled to claim major legislative victories. And despite boasts that he would unify Washington, his presidency has only intensified a long-developing trend of party warfare. So far, Trump has not shepherded major bipartisan legislation through the House and Senate. His single big accomplishment is a tax overhaul law that was written exclusively by congressional Republicans and his White House aides, which received nary a Democratic vote on either side of the Capitol. Trump also pushed unsuccessfully to repeal and replace the 2010 health care law — working only with Republicans and securing only Republican votes. Trump has deployed top deputies like his chief of staff, John F. Kelly, and top domestic policy adviser Stephen Miller to strike an immigration deal with Republicans and Democrats. But so far, they have yet to fashion an agreement. What’s more, when members of both parties had to get together on a shutdown-ending spending bill late last month, Trump took a back seat. His budget director, Mick Mulvaney, admitted as much on Jan. 23. “Sometimes not going to the table is one of the best things you can do in a negotiation,” Mulvaney told CNN. Eventually, whether it is on immigration, an infrastructure package or federal spending, the president will have to work across the aisle. An analysis of votes cast in 2017, however, shows in a stark way that Trump simply has not done that one year into his presidency. The data shows that Trump — like his immediate predecessor, Barack Obama — enjoyed overwhelming support from his own party and staunch opposition from the opposing one. Republican senators last year voted with Trump 96 percent of the time on legislation or nominations for which his stance was publicly known before members cast their votes. On the House side, GOP members sided with the president 93 percent of the time his view was known. Both of those scores are historically high, according to data compiled by Roll Call since 1954 — the highest in that time period for House and Senate Republicans standing by a chief executive. 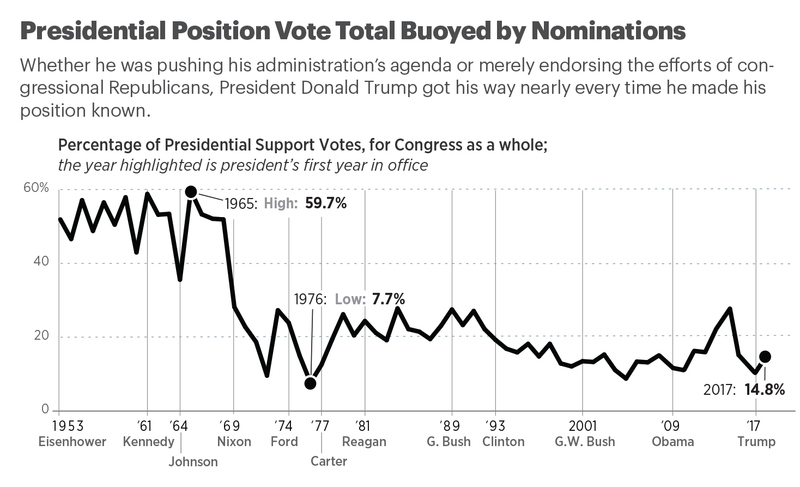 The Senate support level exceeded its previous high in 2001 and 2003, when GOP senators voted with George W. Bush 94 percent of the time. How the Trump presidency has furthered the trend of partisanship also is reflected in how Democratic members of both chambers voted when they knew his stance beforehand. House Democrats voted against the president 82 percent of the time, the second-highest opposition score. The level was behind only the conference’s opposition to Bush in 2003 (93 percent). On the Senate side, Democrats voted against Trump’s positions 61 percent of the time. That level also is the second-highest, behind only Senate Democrats’ 65 percent opposition to the elder George Bush as he was running for re-election in 1992. Of all Senate votes (117), 36 percent were taken with knowledge of where the president stood on the issue. For the Senate, that is the highest score for a president’s first year since Ronald Reagan’s 128 in 1981. When nominations are weeded out, the Senate voted 23 times knowing Trump’s position (10 percent). But only 19.7 percent of Senate votes cast with the president’s stance known were not nomination votes, the second-lowest total in three decades. Senate Republicans opened the floodgates for nominations, giving Trump 94 confirmation floor votes last year, compared to 44 for Obama in the last two years of his presidency while the chamber was under GOP control. Senate Democrats supported Trump 37 percent of the time when his position was known, the lowest score for either party since the same conference backed George W. Bush only 34 percent of the time in 2008. (By comparison, the lowest rate of support for Obama’s known stances by GOP senators was 40 percent in 2013.) Still, Senate Democrats’ 2017 score was only the fifth-lowest since the annual analysis started. For House Democrats, their level of support for Trump was even lower, voting in support of the president’s known positions just 16 percent of the time. That is the second-lowest level since 1954, behind only a 7 percent score of support for George W. Bush in 2007 (7 percent). And while some Senate Republicans have been outspoken about things like Trump’s rhetoric on race and his suitability for the presidency, they voted with him at almost every opportunity. Not only was the 96 percent of presidential support among Senate Republicans their highest ever since the analysis began, the 93 percent among House GOP set a record too. Perhaps better than any other set of numbers, those seem to underscore how Trump’s erratic, nationalist and conservative base-focused presidency has failed to match his campaign-trail rhetoric of becoming a master Washington deal-maker who works with Democrats as often as Republicans. Nevertheless, the raw numbers show Trump succeeded in getting his way on nearly all the votes he weighed in on. Trump went 94-0 on nomination votes last year, bested only by Obama’s 124 in 2014. Excluding his perfect record on nominations, his 91.3 percent success rate was bested only by Obama, again in 2009, for any president over the past 30 years. But notably, the 21 legislative successes ranked 22nd over the same three decades, undercutting Trump’s often-stated opinion that he is breaking “all” records when it comes to his legislative agenda. 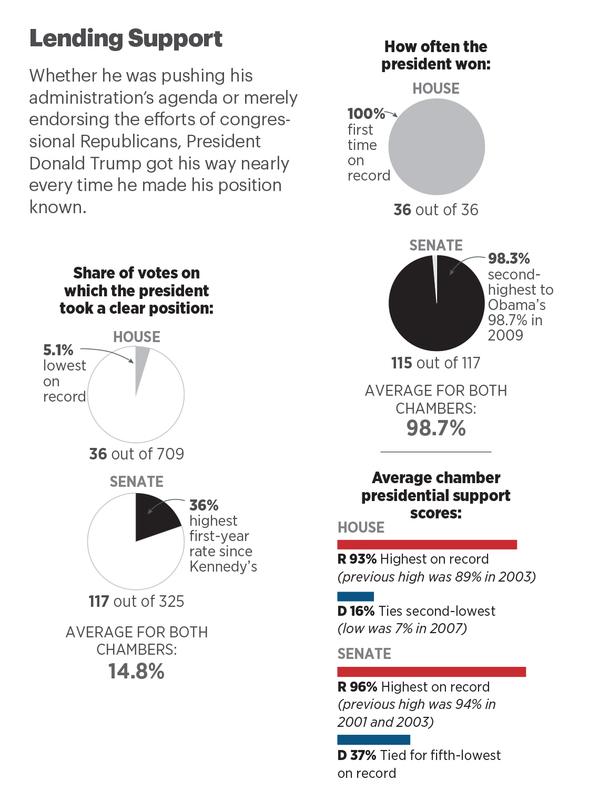 On the House side, Trump was perfect: 36-0 on votes that members took knowing where he stood. The 2017 data show Trump’s first year only furthered a consistent trend line within the 63-year-old study that reveals a steady progression of partisanship building between Congress and the presidency. During the eight years between John F. Kennedy’s inauguration and Lyndon B. Johnson’s last day in office, the average Republican member voted with that Democratic duo 41 percent of the time. GOP House members voted with Jimmy Carter 36 percent of the time and with Bill Clinton 31.5 percent of the time. But since Clinton left office, the chasm has gotten wider. So what changed since 2008, when America elected its first African-American chief executive? Both political parties became less and less politically diverse; in the past, ideological diversity likely encouraged compromise. Those days appear to be over — at least for now. The growing distance between the parties in Washington reflects a broader societal trend. A recent Pew Research Center poll found there is a 36 percentage-point chasm between Republicans and those who lean Republican and Democrats and those who lean Democratic.